Look Sharp, Sconnie - Midwestern Fashion Nerd, Chronic Over-thinker: Nerd's eye view. I'd like to think that by Sunday, when I leave Paris, I'll have learned all of the secrets. All of the vintage nooks, the special "non-touristy" tourist destinations, the cheapest coffees, the cutest waiters, the oldest buildings ... the things that any self-respecting Parisian would claim to know. But then again, what fun would it be if I didn't leave some things to be discovered? For example, at this moment, I believe I've found the best lookout spot in the city. Tables for lounging, food for eating, railings for leaning, pigeons for scavenging - the whole shebang. True, the Eiffel Tower may offer a more spectacular angle - and Sacre Coeur a more all-encompassing vantage point, but there's something to be said for the priceless (but very pricey) combination of clothing and culture offered by the Printemps terrace. After nine floors of far-fetched fineries, tear-jerking tapestry boots, and enough leather to clothe a cattle calvary, a little perspective is just what the psychiatrist ordered. But I'm guessing there's another secret little perch just waiting to be found. 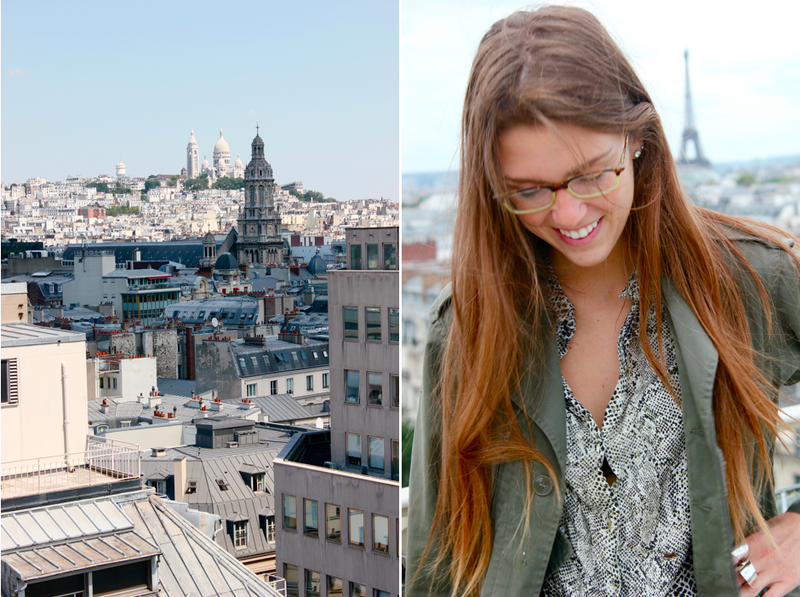 Paris is as beautiful as ever - I adore your grey denim with the subtle accents of the printed blouse and green jacket and even the tiny splash of color on your glasses. Subtle and totally Parisian chic! I am so sad to hear you are leaving Paris. I have really really enjoyed living vicariously through you and your travels! Undoubtedly you have discovered all the best spots but without question you will come back in a few years to find that they have changed/disappeared or are simply just not how you remembered them :(. But that makes discovering new spots all the more fun! nooo can't believe you're leaving! I've been loving these posts, looks like it's been an amazing trip. LOVE your blouse btw.